Dental veneers (sometimes called porcelain veneers) are wafer-thin, custom-made shells of tooth-colored materials designed to cover the front surface of teeth to improve your appearance. You will need to discuss the best choice of veneer material for you with our dentist. Braces is a huge commitment and investment of your time and energy. Instead of resorting to orthodontics, porcelain veneers allow you to quickly and effectively correct minor dental problems with your teeth. For example, teeth that project too far backward or forward can be reshaped by our dentists so when veneers are applied, the arch of your teeth improves and make your smile attractive. 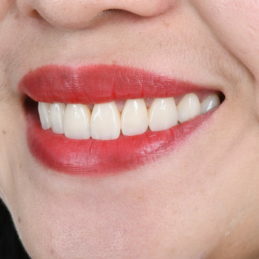 Porcelain veneers can help whiten your smile, veneers will be matched to a bright and natural color. The expected lifespan of a porcelain veneer is somewhere between 7 and 20 years. Veneers sometimes may be dislodged or chipped. If this happens, they can be repaired or replaced. Also, over time, the living tooth and gum tissue around the veneers will undergo changes that may require alterations to your veneers. No, porcelain veneers should never stain. How much does my dental veneers cost? The cost for dental veneers ranges depending on the material of choice. Placing veneers also requires a high degree of technical skills, attention to cosmetic details and considerable amount of clinical time. All these are factored into the costing.